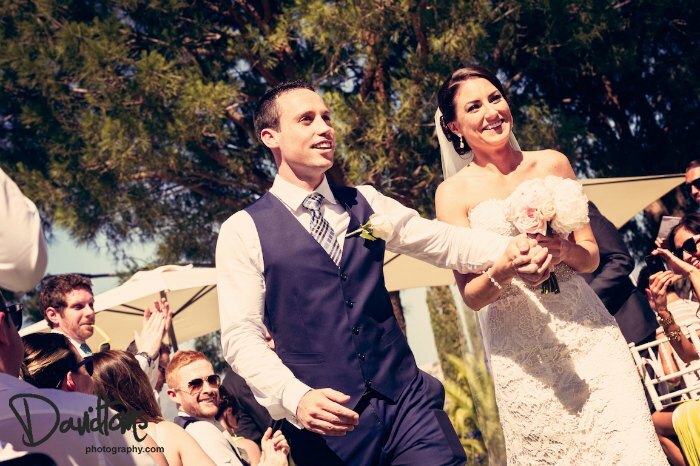 A few months ago we brought you the beautiful story of Barry and Genevieve, an American bride and her Irish groom who married in Hacienda San Jose for their villa wedding in Spain on the Andalucian coast. ‘’It’s so hard to pick a few highlights from our wedding experience. It wasn’t just about the wedding day,the whole thing from start to finish was amazing. From the moment we met Scott to saying goodbye to the hacienda, and everything in between, was so special to us. Honestly, our wedding would not have been the same without Scott and the whole Sunshine Weddings team. All the work and heart they put into it was unreal. I was extremely detail orientated when it came to practically everything, but no matter how many times they probably wanted to throw their laptops into the sea after reading another email from me, they never made me feel like anything was too much to ask. We just adored Scott and know that any time we’re in Marbella he’ll meet us for drinks, and the same goes for any trips to Dublin! Hopefully sooner rather than later. Without doubt one of the main highlights for us was seeing the Hacienda San Jose for the first time. It was just magical and absolutely everything we could have dreamed of and much more. It was amazing to relive that feeling again when our friends and family saw it for the first time. It will always hold a very special place in our hearts. The wedding day went above and beyond our expectations. The sun was beaming, not a cloud in the sky! We could not have asked for more. Scott and the team, as well as Heather the caterer, Virginia the florist, Paco the videographer, the band and last but certainly not least David Toms our amazing photographer, outdid themselves! We had a very lively young group of guests and the drink was flowing, probably a lot more than Scott thought! We had doubled our drink order in a panic, worrying there might not be enough, and even after that our guests managed to fly through all of the vodka! But Scott saved the day and ran out to buy more vodka and Jaegermeister! He really just made sure everything went seamlessly. We never once felt that he didn’t have everything under control. My mom still can’t talk about the wedding without crying! Even 10 months on, we still get a little pang of sadness that it’s over. When something so special happens in life, you just want to relive it again and again! Thank God for our incredible photos and video that David Toms and Paco created for us. Ugh, simply amazing! Hopefully one day, we’ll have a vow renewal at the Hacienda and Sunshine Weddings Spain will have to deal with us all over again…and this time Scott will have to be a guest! With couples like Gen and Barry it’s no wonder that we have the best job in the world, and we can’t wait to get more letters like this one from all our brides and grooms this year!